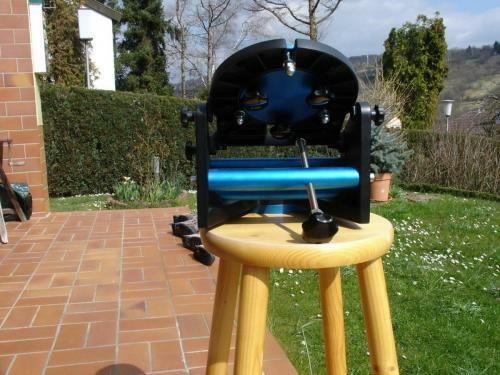 I want to run my LS6 in equatorial mode. 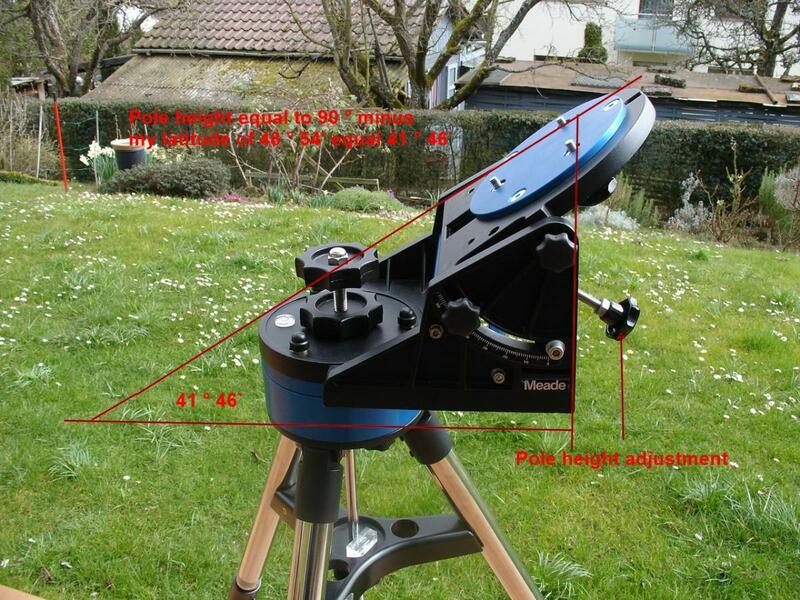 Mount Type >>> Equatorial works or rather, can be activated? A comment from a representative Meade would be very good! I would my LS6 "on a Meade LX90 mount wedge and then try for astrophotography to achieve longer exposures. What do you say, that's possible. Waiting forward to your answers. I inquired about doing that very thing with my LS 8 one time. I did not find out if the equatorial option that shows up on the handset actually worked, but was told the mount was not strong enough to run my LS 8 in that mode. However, I did not talk to anyone about running an LS 6 that way. I have asked someone. I have prepared some structures. 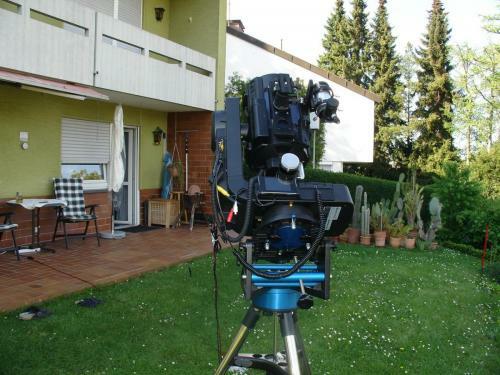 Soon I will show you some pictures here. I want to know whether it is possible with the software 1.6a to activate via the setup menu equatorial mode actually. If so, I'll try. We are sorry for the double posts, did something wrong and do not know how I can delete the duplicate posts. Nobody knows if the LS will do anything with the equatorial mode in the software. That part was intended for another mount and has not been tried by anyone, as far as I know. If you do try it, I would be very interested in what you find out. I'll try it and then report me if I had success. Can you please delete the duplicate post !! Thank you very much and have a nice weekend. Generally if its in the firmware it works.I have not tried it as I use my LX200 for imaging.I thought i seen someplace where someone added the LS to a wedge but i cant remember where. Then LS turned on end, as always, "Time & Location" found after 20 seconds GPS and "GPS Calculation" >>> "Finding Home" >>> "Finding North" >>> telescope is in terrestrial mode. Setup menu opens >>> Mounting Type on equatorial mount set. At Handbox comes message "Set Scope To Polar Home Position". Telescope roughly at Polaris aligned (Image 2). Confirmed with ENTER! After that rotates on the hand box "... and slewing telescope by almost 360 ° remains toward Polaris and is standing on the hand box "Controll Polaris Then Press Enter" (Image3). Telescope in equatorial orientation and are set to go . Well, as far as the theory of the day, the truth comes only at night. So it should have been for today, the sky does not look very promising. It will be interesting to see how this experiment turns out. So I made the evening night Test yesterday. After the LS switch, Setup was still on equartorial mode, the GPS Aligntment was only processed and then I was asked my telescope mechanically align toward Polaris. I then switched to the setup two star alignment. After I confirmed with Enter, appeared at the Handbox "Ctr. Polaris and press Enter." Polaris made using the control buttons into Okularzentrum confirmed with Enter and telescopic drove to the first star (Arcturus). Something wrong, but visible in the 40mm eyepiece. 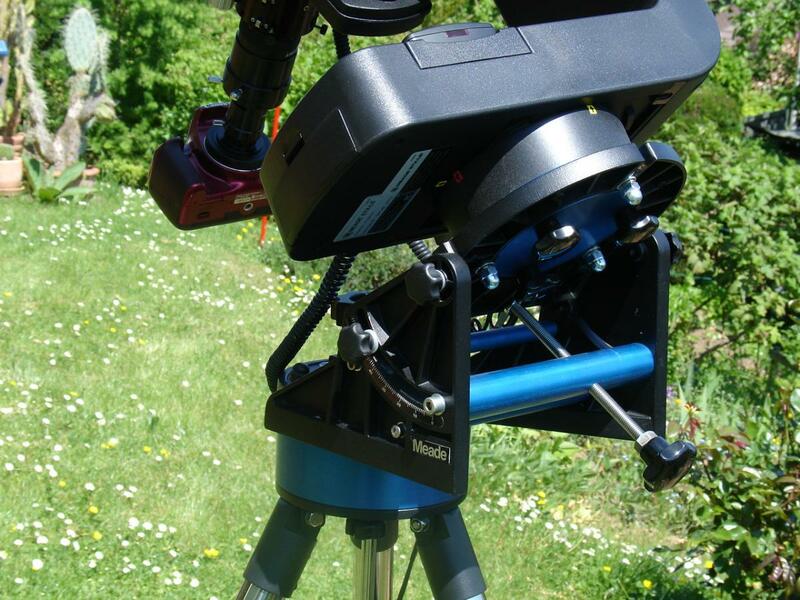 Arcturus in the center of the eyepiece and press Enter. Telescopic drove second star (Vega) to something closer to center than Arcturus, but ok. Finished I thought! !! Approached another star and well made But the tracking was not working! Telskop not move, stepper motors could not be heard and Stern emigrated from the eyepiece and telescope stood still, very still. Next I am not yet come, and have no right solution. Will report. Maybe a white LX200 user a little more for polar alignment of the LS? >>>>>>I thought i seen someplace where someone added the LS to a wedge but i cant remember where. perhaps it falls to them again where they have seen a LS6 on a wedge, I would be very interested. am almost there, Equatorial mode works. I'm going to talk about details. I further tested and can 1.6a firmware work in equatorial mode. It is very difficult to set up the LS6 at Polaris! The mechanical components of the LS6 do not allow the necessary precision. I will try to the structure to make improvements, but I'm not quite sure. I cultivate the idea a polar scope. 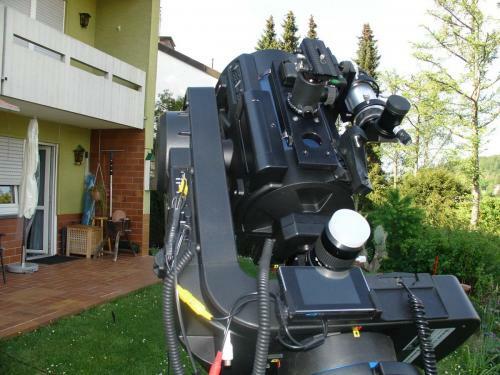 After I brought the Polaris without drive motors so good and right into Okularzentrum and confirm on the hand box with ENTER, the LS6 automatically searches the Polarstern and goes in the equatorial mode and comes Polaris also very close. 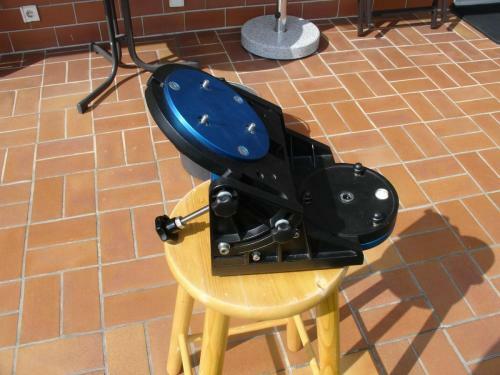 However, in order to control this then as directed by the hand box in the center, the speeds are not adjustable and the speed of the drive motors can not adjust it and it takes a very long time until the Polaris in the center. 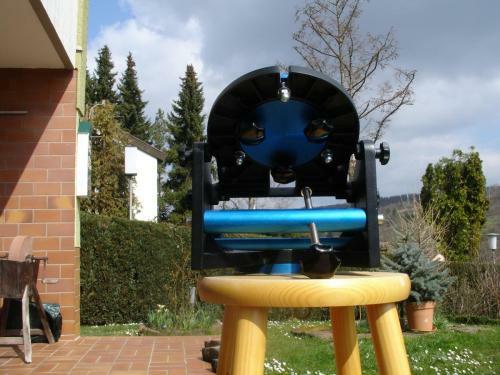 If that is successful, the telescope moves to the first star (Altair) that takes this and although Altair is not 100% in the Center, but you can correct well. 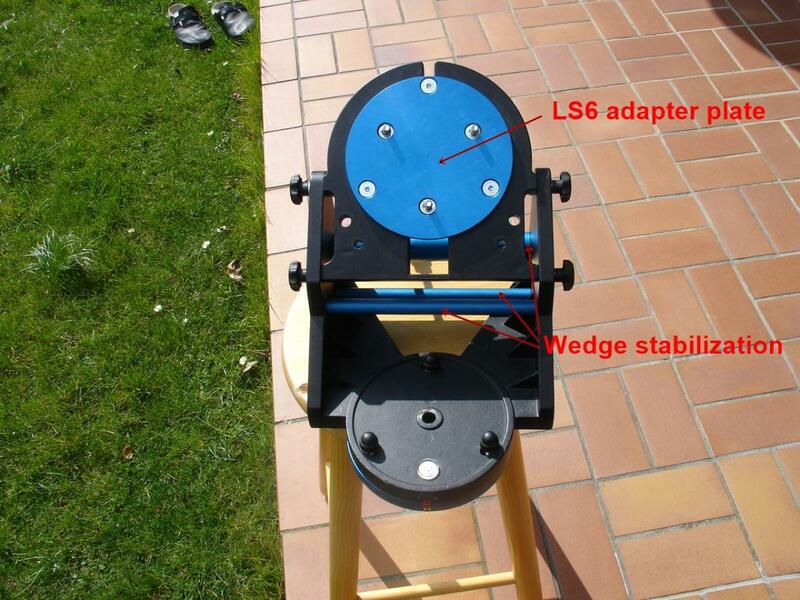 Mechanical construction of the LS6 is not suitable for the equatorial mode. I must say, it was an attempt, and I will continue to think about it in order to achieve improvements. If I have new insights, I'll tell. Thanks for the update. I had inquired about doing that at one time, a few years ago, and was told the mount was not strong enough for that. Apparently, you have confirmed that this single arm mount is not quite strong enough. 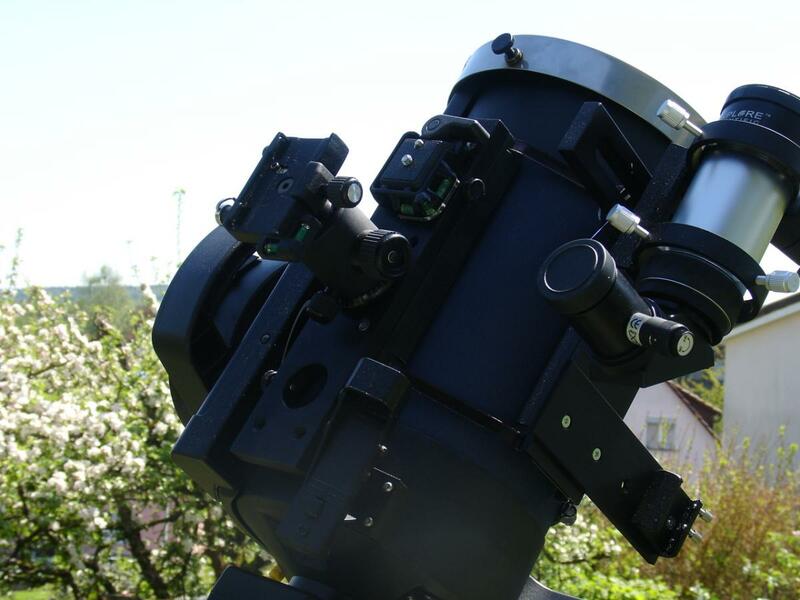 I speculate that someone was thinking it might be possible and built the software with that ability in mind, or using the AutoStar III system on a telescope that could work equatorially. Thanks for the answer. I have not given up and consider further steps to come to success. As I always do my observations at the same site, it will succeed me maybe a mechanical solution to the set on Polaris to find without motor control. A big advantage of the equatorial mode is that there are no problems with a Kollission to the frame and the insight into the eyepiece is almost always optimal. I will continue to report. there is "harveyb3" on the the LS yahoo group that is having good results with a wedge. Thanks for the link to Yahoo. wants to report me again today to report how it has gone further with my equatorial (equatorial) reconstruction of the LS6 and how the current state is. Having stabilized the wedge (see blue parts of the wedge) and a better adjustment of the wedge as've achieved in the original version, I am now much more accurate when Einnorden at Polaris. The setting of the azimuth is the three-point support (see photos) easily and accurately. Absolutely necessary as can be seen in the picture Polsucher. Set LS6 tube and frame as precisely as possible at an angle !!!!! (See figure "Basic Orientation"), as measured by the frame and tube !! I've done with my phone and a protractor app. 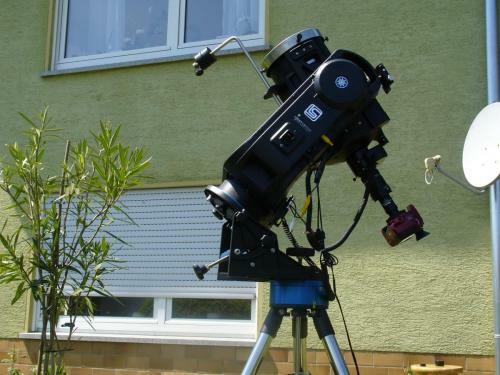 Polhöhenwiege needs (see picture) of 41.46 ° (90 ° -48.54 ° = 41.46 °) have for my site = 48.54 ° angle !!! 1. 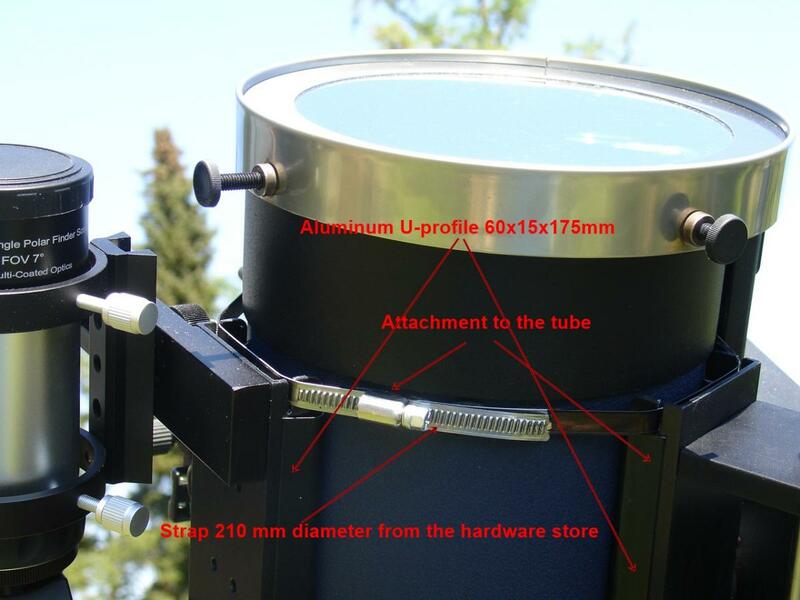 In the telescope a reticle (12.5 mm) lit. 2. With azimuth adjustment and wedge the Polarstern exactly bring in the center of the crosshairs! 3. Set Polsucher to match the center of Polsuchers with the Polarstern. 4. LS6 turn. GPS Search wait. can play media announcement or terminate with Media button. 5. Check whether Polarstern in the center of reticle and Polsucher is. 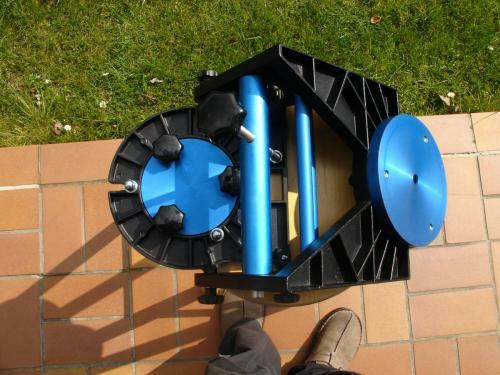 exactly bring to the positions in polar finder !!! 7. LS6 press Enter and follow the instructions on the hand controller, ie the arrow keys to Polarstern bring back into the center of Fadenkreuzokulars. If everything is in order again press Enter and telescope goes to the first alignment star. If alignment star in the center, then press Enter and monitoring can begin in equatorial mode. 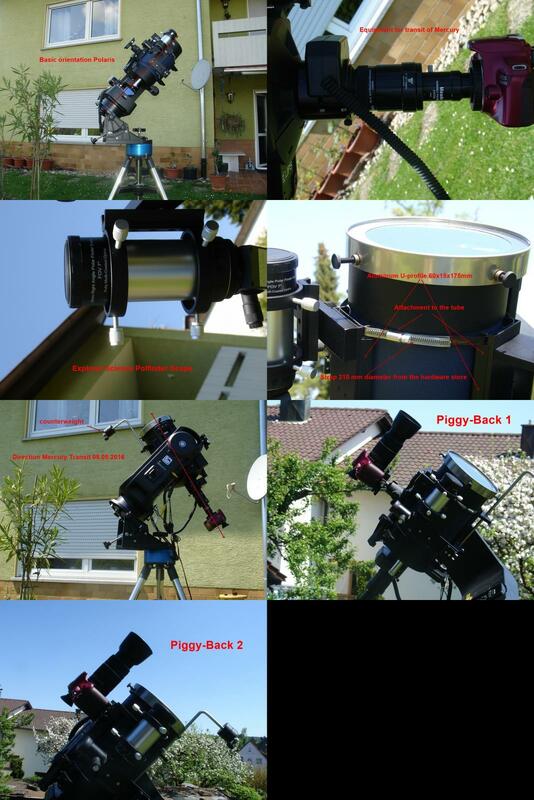 Summary: I'm with the equatorial mount very pleased and indeed have no automatic alignment more, but can do much more equipment to install, without coming into collusion with the frame. More Questions will be, if necessary and possible answers from me. More frames I can choose to be happy here. I hope I have expressed myself much right! ?? 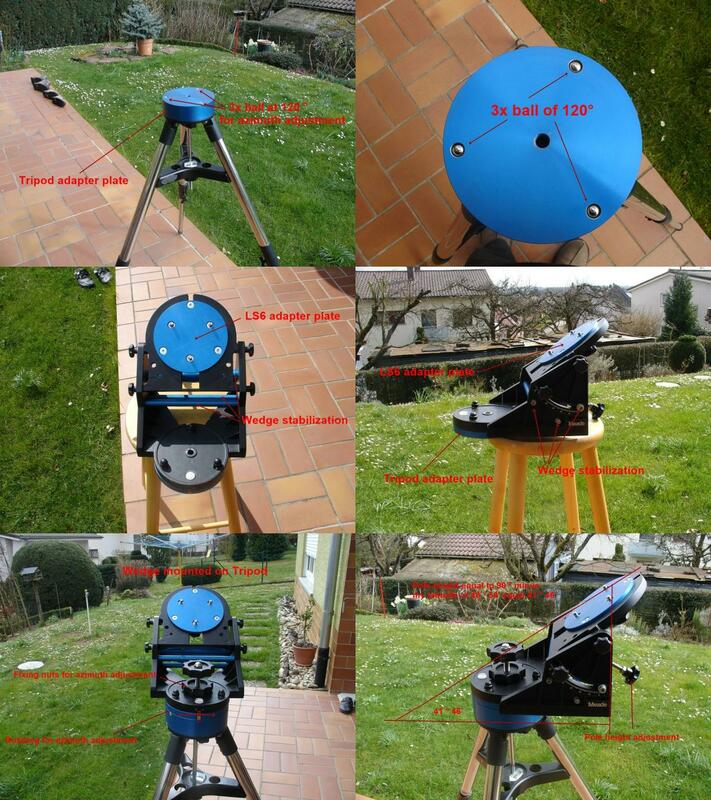 here all pictures mode to equatorial from the conversion.